One essential element for the effective operation of the keys in a piano is that the keypins must be smooth to the point of being slippery. Each note has two of these keypins, the front rail pin and the balance rail pin, that keep the key aligned in its proper position. 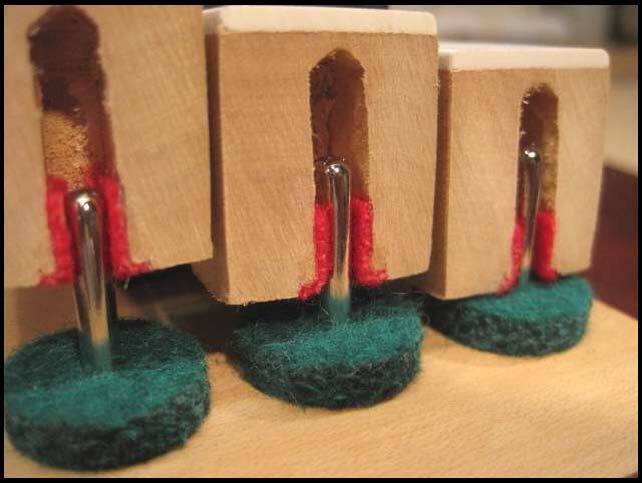 When a note is played and the key rocks forward, the felt bushings of the key make positive contact with the keypins to prevent any wobbly sidetoside movement. Any corrosion on the surface of either keypin will result in unwanted resistance, and will produce excessive wear and tear on the bushings. 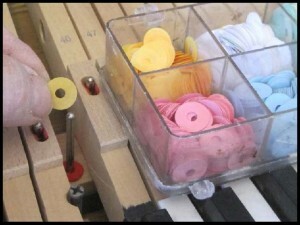 If the original keypins in your piano have become badly corroded, replacement with a new set would be the best solution. A new set of keypins help give keys a new “feel” when the piano is played. How does one decide when a set of keypins need replacing as opposed to a simple polishing? The deciding factor is if the surface of the keypins has succumbed to corrosion or not. 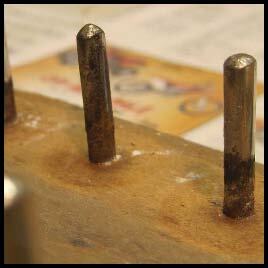 If the pins are simply tarnished, a gentle polishing may be all that’s necessary to restore things to good order. 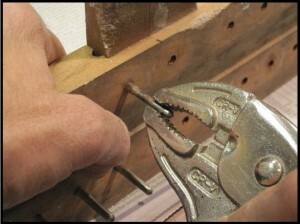 If the surface of the pins has become pitted, however, replacement is necessary. Corrosion becoming noticeable on a set of keypins is similar to rust bubbles appearing on the surface of a car’s fender. It’s almost certain that the damage is more than what meets the eye. In the case of keypins, even if a piano technician were to grind off the corrosion, the slippery nickel plating would be gone, and the dimensions of the keypins would be changed. In the above photo, the front 3/4″ of a set of three keys has been cut away to reveal the keypin / bushing system that stabilizes the keys and allow for nearly frictionless up and down movement of the keys. Smooth, polished keypins and good quality bushing felt (the red felts on the insides of the mortises) are essential for this system to work efficiently. The bushing are sized so that the felts make gentle, but positive contact with the keypins. Ideally, there is a nearly imperceptible resistance on the keys but an absolutely smooth movement up and down with no play (wiggle) perceived to the right or left. The photo to the right shows front rail pins corroded beyond repair. 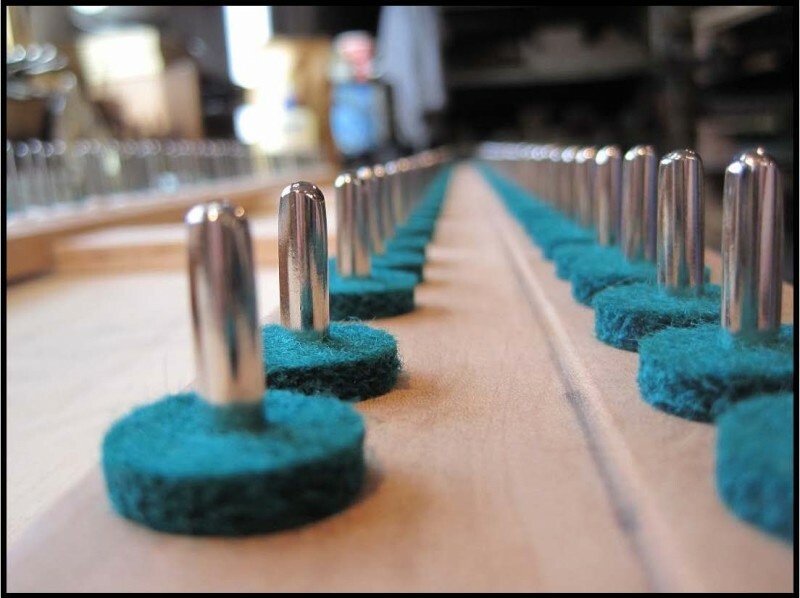 (The cover photo shows the condition of the balance rail pins from the same piano) The gritty surfaces of such pins act as an abrasive and quickly chew into the felt bushings as the piano is used, leaving keys which have discernable wobble. The only solution in a case such as this is to carefully remove the old pins and replace them with a new set of highquality keypins. How is the removal of the old pins accomplished? The keys need to be removed from the piano to access the keypins. Additionally, the keyframe itself is typically removed so that the repair work may be done on a workbench. 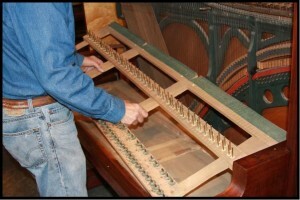 In the case of a grand piano, the action is removed, then the upper stack is taken off of the action to access the keys. Front rail pins are here being carefully removed from the keyframe with a pair of visegrips. 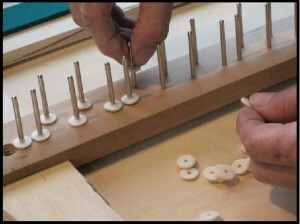 By gently turning the pins back and forth as the pins are being pulled out, the holes that the pins are driven into are not put out of round. Careless removal by an untrained technician can result in loose fitting replacement pins, making a bad situation worse. In the photo to the left, balance rail pins are shown being tapped out from the underside of the balance rail. Again, care is taken not to damage the original hole. The old pins will be measured with a micrometer to determine their exact size. The new pins, when they are driven in, will be tight as long as care has been taken in removing the old pins. What are the basic procedures for installing a replacement set of keypins? 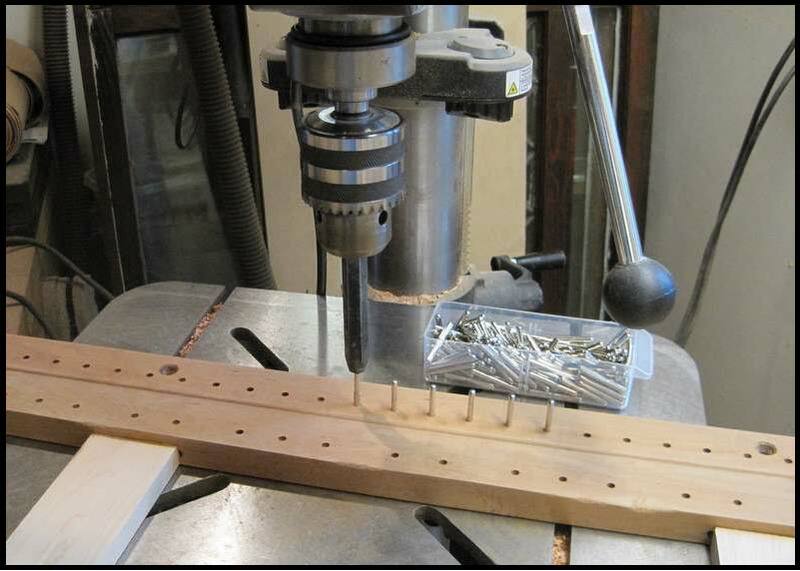 Front rail pins being pushed into place using the “press” feature of a drill press. Careful measurements are taken to ensure that correctly sized keypins are installed into the keyframe. 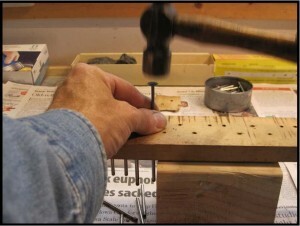 To avoid marring the surface of the new pins (typically nickelplated), a press is often used to push the new pins into place to the correct depth. With the piano disassembled to this point, it is an opportune time to complete any work related to the keyframe which might be needed. In the case of the key frame shown in these photos, mice had done considerable damage to the portions of the framework made of basswood (the fronttoback supporting members). The balance rail and front rail, being made of hard rock maple, were untouched by the mice. New basswood parts were cut to match the old, the rails were sanitized with baking soda, and the resulting framework was as good as new once the work was finished. Is there other repair work which would complement this job? Yes, three other jobs in particular are often needed at the same time as keypin replacement. First, since the surfaces of the original keypins were corroded, an inordinate amount of wear and tear to the key bushings often has taken place. The old bushing felt may be removed and replaced with new, high quality bushing felt that will work together with the new balance rail pins to produce a likenew feel to the keys. 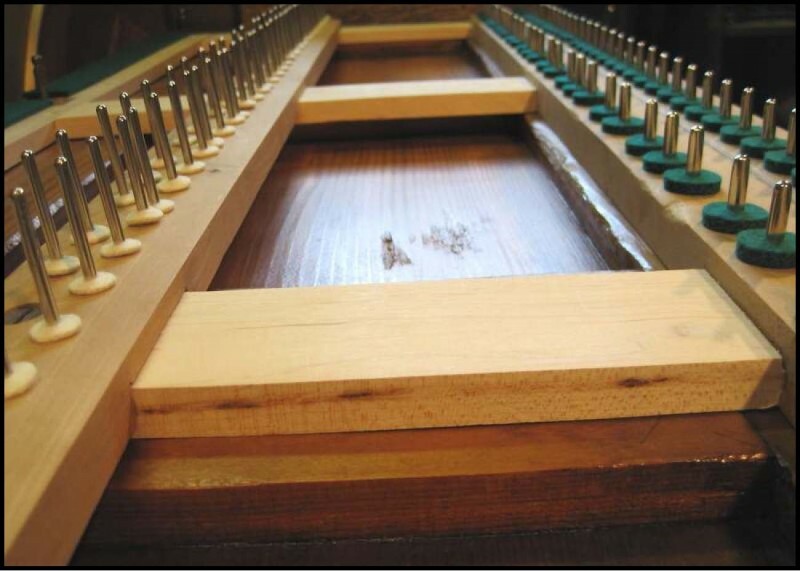 Secondly, while the keyframe is out of the piano, it is an ideal time to consider having the old back rail cloth, balance rail punchings and front rail punchings replaced with new. These felts cushion the keys and help the keys operate silently. Many times the old cloth is either worn out or has been damaged by moths or mice, both of which have a fondness for felt. Finally, with all the other work being done, the keys will need to be leveled. 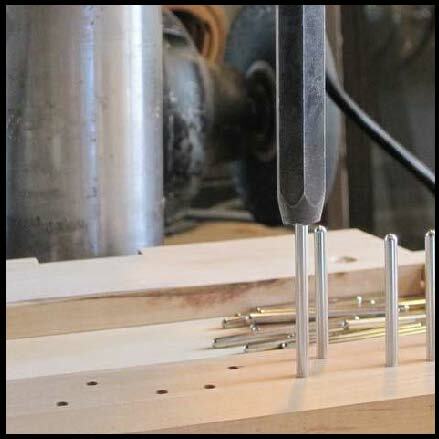 This is done by placing paper punchings under the balance rail punchings to bring the height of each key up to a precise setting. Better yet, the piano could be given a complete regulation, so that the newly refurbished keyboard is working in harmony with the action to deliver optimum performance from your piano. New front and balance rail keypins, ready for the installation of a rebushed set of keys.